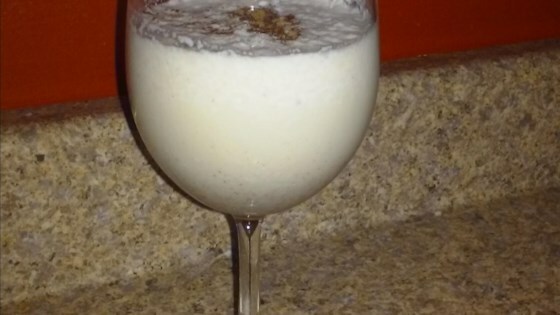 "Coquito is a popular Christmas coconut rum nog traditionally served in Puerto Rico. This is my mother's egg-free recipe which has an ice cream twist. Sprinkle with ground cinnamon or nutmeg and serve. Cheers!" Place cream of coconut, condensed milk, evaporated milk, coconut rum, water, ice cream, and vanilla extract in a blender. Blend until smooth and well-combined, about 3 minutes. Pour coconut mixture into two 20-ounce glass bottles or jars. Add 1 cinnamon stick and 1 clove to each container; shake well. Chill coquito 8 hours to overnight. Shake container before pouring coquito into shot glasses or small cups. Sprinkle cinnamon or nutmeg on top before serving. I save up my Rose's Cocktail Infusions® bottles. Carefully peel off the label, then rinse thoroughly with hot water. Delicious! I skipped the water, I don't mind the thick liquid. I also made it with a bit more run and made it spiced rum. Great stuff!